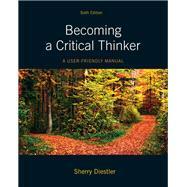 BECOMING A CRITICAL THINKER: A USER FRIENDLY MANUAL, 6/e trains students to distinguish high-quality, well-supported arguments from arguments with little or no evidence to support them. Additionally, it develops the skills required to effectively evaluate the many claims facing them as citizens, learners, consumers, and human beings, and also to be effective advocates for their beliefs. Who Is a Critical Thinker and When Do You Need to Be One? What Price Ethics and Can You Afford Not to Pay? It’s Eleven O’Clock. Do You Know Where Your Assumptions Are? Prove It to Me—What Are the Statistics? Who Said So? And Who Are They Anyway? Is What You See What You Get? Do You Really Want It? What’s Your Point? How Do You Sharpen It?